WASHINGTON: Bodyguards For Turkish President Beat Protesters, Nine Injured, One Critically [VIDEO] - Joe.My.God. 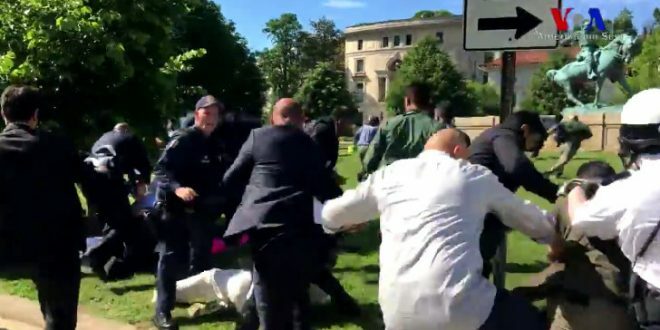 Footage has emerged of a mass brawl outside the Turkish embassy in Washington during which men believed to be Recep Tayyip Erdogan’s bodyguards are seen attacking protesters just hours after the Turkish president’s meeting with Donald Trump. The brawl ensued as Erodgan’s security detail and pro-Erdogan supporters confronted Kurdish and Armenian demonstrators. A video—posted by Voice of America—showed punches and kicks being thrown by both parties as the fight spills onto the grass outside the embassy. One man holding a megaphone is shown being kicked in the face by a man in a dark suit. U.S. police officers are seen attempting to separate the two parties. Police arrested two people as a result of the brawl, which left at least nine injured and one in critical condition.